NEW SMYRNA BEACH (USA)- Without knowing he became an online star after a video of a shark leaping over him went viral. The ‘mystery surfer’ has finally spoken publicly about his heart-stopping encounter on 9News. 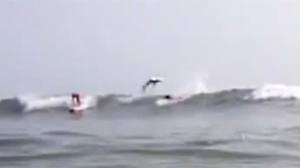 Six months after footage of the close-call with a spinner shark was posted online, Florida local Andy Dabrowski has admitted he was the mystery surfer in the video. Dabrowski was unaware he was being filmed by Orlando Sentinel journalist Jacob Langston while surfing at Florida’s New Smyrna Beach in June, until video of the incident surfaced online. Unfazed by the incident, Mr Dabrowski decided to stay in the ocean and finish his surfing session. Sharks came with the territory and would not stop him from surfing, Mr Dabrowski said. New Smyrna Beach is known for its large shark population. See Dabrowski in a video on 9News.